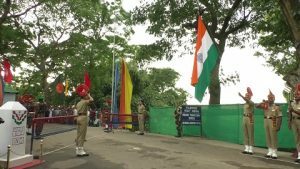 Kaptan Singh Solanki who took charge as Tripura’s new Governor visited the Agartala integrated check post (ICP) on Wednesday. 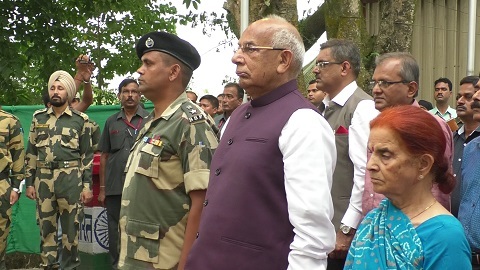 Along with the Governor, the First Lady of the State, Rani Solanki enjoyed the Beating Retreat ceremony of Flag Lowering ceremony performed jointly by the Border Security Force (BSF) and the Border Guard Bangladesh. Like the famous Attari-Wagah border between India-Pakistan, the unique ceremony of display by the massed bands during ‘Beating Retreat’ ceremony is held here every day during the sunset at the Agartala-Akawra border between India and Bangladesh. ‘Beating Retreat’ marks a decades-old military tradition, when the troops ceased fighting, sheathed their arms and withdrew from the battlefield and returned to the camps at sunset with the sounding of the Retreat. The first beating retreat ceremony was carried out in 1959 between border guards of India and Pakistan when Major Roberts of the Indian Army developed it.